Giving Hope Lawn Management offers landscape mulch delivery and installation services. We offer free consultations and quotes. To get your free quote call us today. There are many products available to nourish and protect your yards. But most rely on harsh chemicals that may cause grass and trees to get sick instead. How can you give your yard better care without harming them in the process? For most, the solution is quality landscape mulch services. 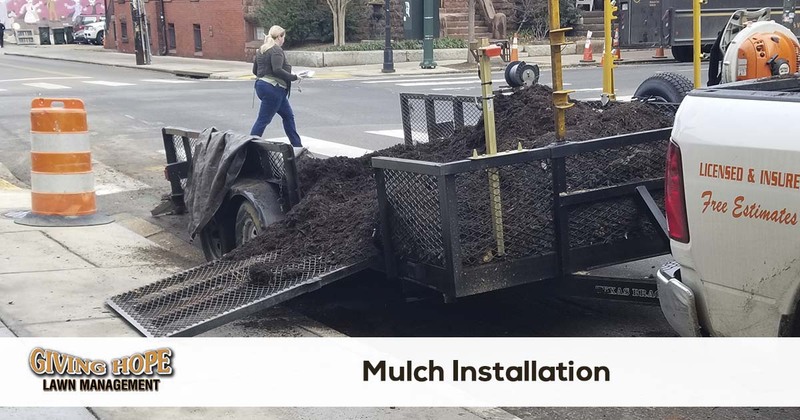 Mulch installation is a natural process where ground up wood, leaves, and other organic materials release nutrients back into the soil. And best of all, most weeds and bugs find it too thick to live around. But most mulching products come prepackaged, and they’ve already lost some of their usefulness when it gets installed. Instead, you must have fresh mulch delivered straight to your door. In addition to providing the best in complete landscaping services, Giving Hope Lawn Management also offers mulch delivery service. When your yards need something to improve its overall well-being, natural mulch installations are often the best choice. Call today for your best lawn mulching. We offer the top quality product at affordable pricing every day! Whether you intend to install it yourself or have us handle it for you, we offer prompt delivery any time you need. We stock only the freshest mulch we can find in the greater Richmond, VA area. There’s no need to purchase expensive prepackaged mulch that won’t do a thing. Instead, your yard deserves the best quality possible! In just a short amount of time, you can expect an entire load of fresh, organic mulching that keeps your lawns green for longer. No other natural product achieves the results as organic mulch does! When you can’t find the product that’s best for your lawns, we are here for you. Call today for your best mulch delivery options! Mulch installation is one of the top ways to add color to your lawns, as well as promote better healing overall. Our team offers quick service wherever you need our best additives! We offer a variety of mulching that can tie your outdoor spaces together. Choose whichever ones work best for your style, including brown, red, black, pine bark, and natural wood mulch. Weeds will struggle to grow underneath mulch, while nutrients release overtime back into the soil. Without toxic sprays and products, your plants will soon look healthier than ever! Whether you’d like specific colors for specific planters or the same type of mulch throughout, we are here for you. Call today for your best mulch installation services! If you’ve only applied prepackaged products and harsh concentrates, you just aren’t treating your yard right. Instead, they need a natural choice for healthier growth. Call Giving Hope Lawn Management today for your best mulching options. We can give you the perfect yard for less on every project! Ready to have landscape mulch installed on your property or just need a quote? We make it easy to get a free quote and schedule your service. All you need to do is request a quote online or give us a call today!